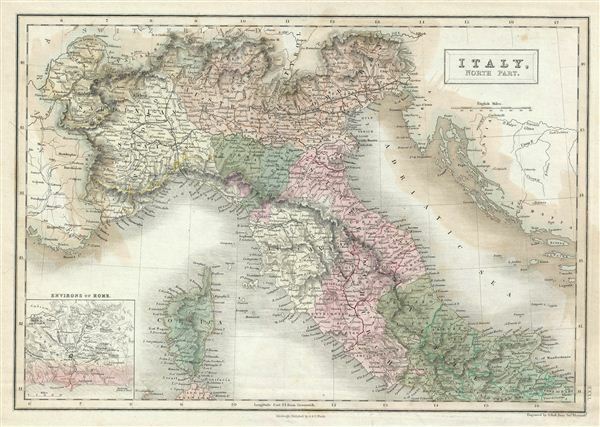 This is a fine example of Adam and Charles Black's 1851 map of northern Italy. The map covers the island of Corsica and Northern Italy, including the regions of Tuscany, Modena, Parma, the Sardinian States, Austrian Lombardy and the State of the Church. It also includes the northern extension of the Kingdom of Naples. An inset map in the lower left quadrant depicts the environs of Rome. As this map was being drawn, Italy was undergoing the process of Risorgimento, where the different city-states of the Italian Peninsula struggled for solidary as a single Italian nation. Throughout, the map identifies various cities, towns, rivers, mountain passes and an assortment of additional topographical details with relief shown in hachures. Map is hand colored in pink, green, blue and yellow pastels to define boundaries. This map was engraved by Sidney Hall and issued as plate no. XXXI in the 1851 edition of Black's General Atlas of the World. Sidney Hall (1788 - 1831) was an English engraver and map publisher active in London during the late 18th and early 19th centuries. His earliest imprints, dating to about 1814, suggest a partnership with Michael Thomson, another prominent English map engraver. Hall engraved for most of the prominent London map publishers of his day, including Aaron Arrowsmith, William Faden, William Harwood, and John Thomson, among others. Hall is credited as being one of the earliest adopters of steel plate engraving, a technique that allowed for finer detail and larger print runs due to the exceptional hardness of the medium. Upon his early death - he was only in his 40s - Hall's business was inherited by his wife, Selina Hall, who continued to publish under the imprint, "S. Hall", presumably for continuity. The business eventually passed to Sidney and Selina's nephew Edward Weller, who became extremely prominent in his own right. Black, A. and C., General Atlas Of The World, (Edinburgh) 1851. Very good. Minor overall toning. Blank on verso. Rumsey 2305.036 (1854 edition). Philips (atlases) 4334.